"The company was, in June 2017, in arrears on its land lease payments by almost three years [35 months]." "The company has since settled its debt with the NRC [National Research Council], on November 16, 2017, and is a valued client in good standing." "In the conduct of its business, the NRC respects the proper stewardship of financial resources and is accountable for their management to Canadians in accordance with Treasury Board policy." "We knew we were getting a grant [$30-million from the Gates Foundation] in September and we did." "We just asked them [the NRC] to give us the summer [to get the financial fundamentals in order]." The startup biotech company contracted with the National Research Council in 2012 to rent a previously abandoned bio-tech facility in Montreal on federally-owned land, administered by the NRC agency. This facility had been leased to a Dutch company for the princely sum of $1 annually previously, but when the company closed up shop in 2005 the facility was again vacant. When Pnu Vax expressed interest in the site, the NRC was disinterested in offering it to the start-up on the same terms offered to the Dutch company. Father Don and son Jonas Gerson were busy developing a low-cost vaccine against pneumonia, recognized as a deadly disease that is the largest killer of children under five years, world-wide. The costs in developing the vaccine were astronomical, and at one point the Gersons were faced with a conundrum; pay their rent and come up short in their research costs, or suspend their rent payments and focus on their research. They chose the latter route. After all, the National Research Council is the very government agency whose existence fosters scientific excellence. Research coming out of the NRC is often proudly hailed for its scientific firsts in many areas of scientific endeavour. It is a national crown jewel of scientific research. So it stands to reason that scientists engaged in developing a vaccine as significant as that the Gersons were involved in would be given a break. But that was not to be. Their pioneering work close to a breakthrough, convincing enough to the Gates Foundation to offer the largest investment ever given to any Canadian biomedical company failed to convince NRC management that they might be patient in awaiting arrears in rental back-payment in favour of giving the start-up a break. PnuVax received 30 day's written notice to either make good on the outstanding rental, represent $1-million, or be prepared to demolish the manufacturing facility and evacuate the premises. Father and son decided to go to Ottawa to personally speak with NRC president Iaian Stewart, hoping to persuade him that when the Gates grant came through at the end of summer, the past-due rent would be paid, and to put off the order of evacuation. What they found, when they made their case, was scorn and refusal when Stewart laughed off the suggestion that PnuVax and the NRC could work out the problem with a positive conclusion. Close to clinical trials of the new drug they had developed, the Gersons hardly knew what next to do. Health Canada approval was pending, allowing the vaccine to be commercialized. The NRC had even supplied one of the chemicals and as such would have received royalty payments. "But he [Stewart] didn't want to listen", Mr. Gerson recounted. Donald Gerson had helped to develop and manufacture the first childhood pneumonia vaccine produced at Wyeth, an American pharmaceutical company, in 2000. He went on to found PnuVax in 2008, with a view to developing a pneumonia vaccine for children world-wide, that would cost a dollar-a-dose. When, in 2012, the arrangement was made to lease the Montreal facility, the Gersons invested in renovating the facility to the tune of $10-million, passing a Health Canada inspection. The lease cost came to $300,000 annually, on top of which was $600,000 yearly in city taxes. PnuVax found its financial resources strained, though it had already received funding from the Gates Foundation which stipulated that the funding was to be used for research only. And then came news that a larger grant would be forthcoming, that would cover vaccine development, clinical trials and facility overheads. Received in September of this year, it enabled PnuVax to pay off its rental arrears, but before that, because of the NRC threat due to non-payment of rent, the company had been on the cusp of insolvency. Bridge financing and desperate determination kept them going. The company now has in its employ 25 well-paid scientists moving the process forward. It costs the Government of Canada $160-million on childhood pneumonia vaccine annually. According to PnuVax, $100-million of that total could be saved if its low-cost alternative is approved. This government partners with the Gates Foundation in its battle of infectious diseases globally. Canada pledged $785-million to the Foundation to combat AIDS, tuberculosis and malaria. Yet the federal agency responsible to lead the innovation agenda of the government cavalierly dismissed a reasonable request by a biotech company to enable it to proceed with its goal to produce a drug badly needed to help fight deadly disease at a reasonable cost. And the final irony can be found in the World Health Organization bemoaning cases of fake medicines it discovered in developing countries held to be responsible for the deaths of tens of thousands of children from malaria and pneumonia every year. 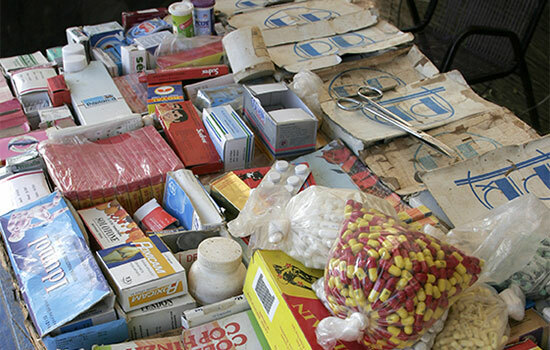 One hundred studies of over 48,000 medicines were reviewed by experts who reached the conclusion that drugs to treat malaria and bacterial infections represented close to 65 percent of fake medicines. It is mostly poor countries that are affected, according to WHO's director-general. Between 72,000 and 169,000 children die from pneumonia annually resulting from bad drugs, counterfeit medications held responsible for an additional 115,000 deaths from malaria in sub-Saharan Africa, according to scientists at the University of Edinburgh and London School of Hygiene and Tropical Medicine whom the WHO commissioned to conduct research in the matter. "Without drugs, this war would have been long over." "The heroin is a very important driver of this war." "If an illiterate local Taliban commander in Helmand [Province[ makes a million dollars a month now, what does he gain in time of peace?" Afghan forces destroyed an estimated 100 opium refining laboratories; crude affairs, but very effective for their purpose. That was the proverbial tip of the iceberg, given that there are between 400 and 500 such laboratories scattered in the hinterlands. "They can build a lab like this in one day", admitted General Abdul Khalil Bakhtiar, the country's deputy interior minister whose charge it is to see to the effectiveness of counter narcotics police. It has been hugely profitable for years for the Taliban to tax and provide security to opium producers and smugglers. They see now far greater profits in becoming more directly involved in all stages of the drug business on their own, and they have become rivals to some of the region's major drug cartels. Driven by the riches to be gained, the Taliban -- the group identifying itself as' Islamic scholars' -- has joined the illicit, soul-destroying trade with a vengeance. In 2016, Afghanistan's opium economy had a value of $3-billion, double the previous year's total, representing 16 percent of Afghanistan's gross domestic product, according to figures released by the United Nations. 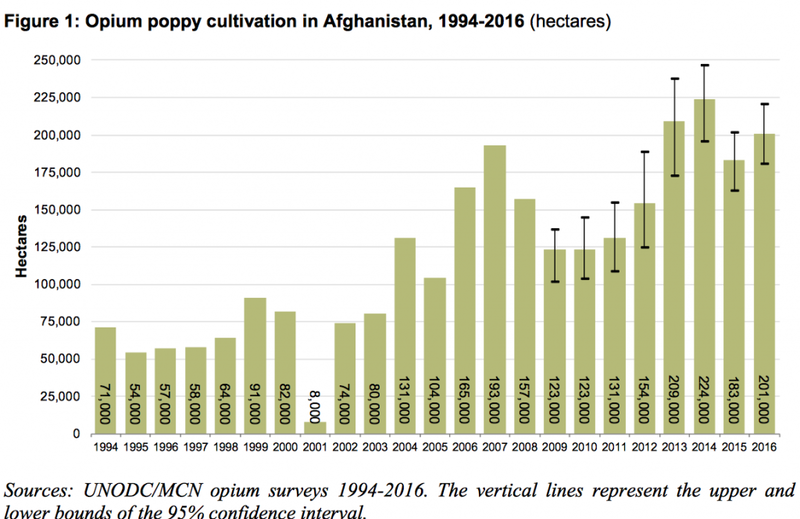 Increased processing on the part of the Taliban has resulted in their grasping a greater share of the $60-billion that identifies the global trade in Afghan opium. Taliban refining operations in the country that produces a staggering 85 percent of the world's opium is reflected in empty barrels to be used to mix precursor chemicals in the production of opium, alongside piles of firewood, a press machine, a generator and water pump, comprising a typical opium processing operation. This is a step forward in profitability for the Taliban which had for years smuggled bulky opium syrups out to be refined elsewhere. Now, an estimated half of Afghan opium is processed within Afghanistan into either morphine or heroin. And refining means the drug is easier to smuggle out, increasing profits, where the Taliban derive 60 percent of their income from the trade. 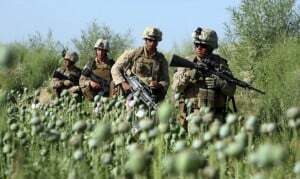 A small police unit, the National Interdiction Unit, comprised of some 450 to 600 commandos mentored by American Special Forces are responsible in attempting to control and disrupt the flow of Afghan drugs to regional and Western capitals. A senior counternarcotics official in Kabul informed that the elite unit followed a network of money launderers in an opium-rich province helping to import the needed chemicals to refine heroin. When the officers collected sufficient evidence to sweep in for a high-level arrest they discovered that a police commander had stepped in to warn the suspect. The National Interdiction Unit stationed in a mountainside base saw its top commander recently replaced when he failed a polygraph test, and "was probably leaking information to hostile forces", according to a report by the U.S. Special Inspector General for Afghanistan Reconstruction. Daily, laborers go into fields to destroy the poppies. Before they do, however, hidden Taliban bombs have to be decommissioned by de-mining teams. "It seemed easy ... but it was tough. It was almost a war there, every day" stated Javid Qaem, deputy minister of counternarcotics. "We knew that the mosque was under attack." "Everyone lay down on the floor and kept their heads down. If you raised your head you get shot." "The shooting was random and hysterical at the beginning and then became more deliberate." "Whoever they weren't sure was dead or still breathing was shot dead." "There wee people on top of me bleeding and I couldn't feel anything." "They were shooting anyone who seemed to be breathing." Exquisitely well planned, organized and munificently lethal. Five all-terrain vehicles, 25 or 30 gunmen in camouflage, and an Islamic State flag declaring the shahada. Surrounding the Sufi mosque, tossing explosives, spraying bullets as Imam Raziq began Friday prayers. People fell on the floor, dead or wounded, the live attempting to minimize their presence while the killers roamed about looking for signs of life, the masked men shooting those still alive in the back of the head. Although they had set fire to parked cars of those within the mosque to deter flight of those attempting to find passage to freedom and life, when the ambulances began to arrive sharpshooters targeted them as well, and the ambulances sped off. The dead numbered 305, the wounded 128 at the mosque where the faithful went to pray to their merciful god of peace. Pledging "extreme force" to "avenge our martyrs", President Abdel Fattah el-Sisi dispatched warplanes to destroy the attack vehicles and occupants. Then Egypt settled into three days of mourning while the media reassured the public that everything was under control. Which is to say the military with its tanks, conflict vehicles, fighter jets, warships and helicopter gunships remained on alert and prepared to defend Egypt and its inhabitants from the malevolence of enemies. A Muslim country on guard from threats and murderous assaults by Deobandi Muslims on a mission of jihad in obeisance to a god that demands it. "Our focus lies in the war against polytheism and apostasy, and among those Sufism, sorcery and divination,"
Egypt's military is prepared to fight back at the Northern Sinai, ISIL-affiliated Bedouin fighting group that has for years seen military and police posts in the Sinai as targets for violent attacks. The military is trained and addresses conflict as an organized conventional fighting force should. The Northern Sinai attackers fight as guerrillas conventionally do. The military has destroyed the tunnels linking the Sinai with Gaza, it has moved residents from their border homes, and quarantined Hamas which smuggles weapons into the Sinai. But this is not a conflict with rules. And Northern Sinai jihadis exult in their freedom to carry out assassinations and launching deadly attacks on posts and convoys. They are not impressed with President el-Sisi's promise that "The armed forces and police will forcefully take revenge for our martyred sons and restore security and stability in the short period ahead." There has been ample time to do all of that and it has not happened. The military leadership appears wanting. An operation to attack the terrorists in t he Western Desert failed when counterterrorism police were so poorly coordinated with security and intelligence agencies that they themselves became 'martyrs' in unintended consequences that resulted in the chief of staff of the armed forces and the premier police generals were demoted. A silent, grim admission of defeat. Neighbouring Libya, a hotbed of Islamist militias trading in weapons and exchanging fighters has opened a new front. Those among the Egyptian military newly trained in counterterrorism along with police deployed for the same purpose have not moved much beyond their early training as police conscripts capable of operating checkpoints. Attack helicopters are useless in mountainous territory representing a haven for the terrorists, a landscape immune to tanks and heavy vehicles negotiating mountain slopes where the militants' light arms, machine guns, roadside bombs and suicide bombers are far more lethally efficient. "We get both kinds of extremists. They both espouse the same garbage -- and in the middle is us." "Upstairs is filling up -- start moving them [an excess of worshippers] to the upper hall of the community centre!" "[Born in Barking] Do I feel scared walking down the street? No, London is my home." "The culture has changed completely. The English, traditional people are just not there anymore." "It is getting frightening. On a Friday afternoon there are Muslims coming out of the woodwork. In 15 or 20 years, this will be a Muslim state completely." "Look, the mayor of London is a Muslim! If nothing is done about it, they are going to be running this country." "He [a local politician] is trying to do what he believes will protect his people." "We are trying to tell him, 'Hey, we are the same people'. If something happens to the United Kingdom, we will be with you by your side to protect it!" "People hear things about Muslims in the media and say, 'Let's kill Muslims'." "But London is different than any more place. We feel like our roots are here. We feel proud of London." Over twelve percent of London's inhabitants now are Muslim. London further distinguished itself as a pluralist society by electing a Muslim mayor a year and a half ago. That no doubt delighted the Muslims who have been seen and heard in public to state their belief that it is only a matter of time before Britain becomes a Muslim sharia state. Londoners are truly conflicted; on the one hand proud of their acceptance of others, on the others alarmed that the heritage and culture they so value is dissipating beyond recognition. Muslims feel comfortable living in Britain. 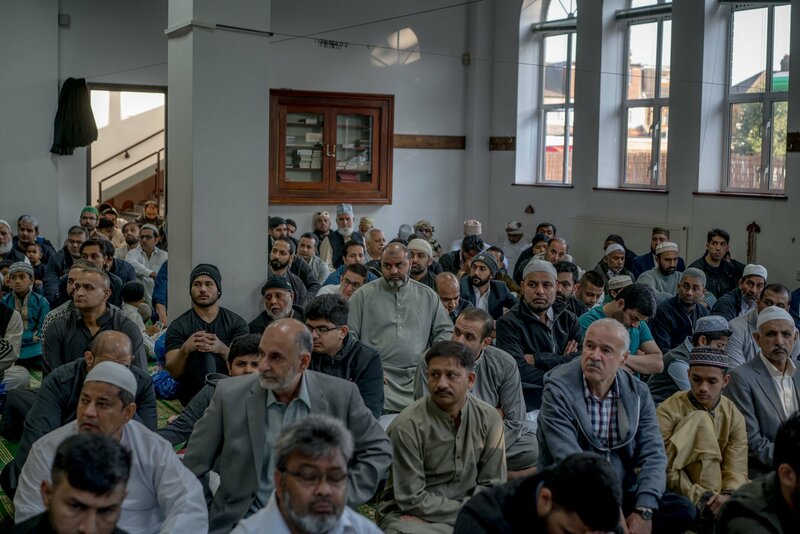 Britons don't feel quite as comfortable living in their country, surrounded by Muslims wearing conspicuously different clothing, speaking an entirely different language, faithful to a religion that is inimical to the presence of other religions in its most basic instructions to its faithful. The occasional sight of large numbers of Muslim men prostrating themselves in public to pray because despite the proliferation of mosques their numbers are insufficient to serve the population of Muslims. That from time to time an eruption of Islamist psychotic violence strikes killing people in surprise attacks with the refrain 'Allahu Akbar!' ringing out for good measure is not comforting to non-Muslims, and nor are the attacks taking place elsewhere in Europe, informing Britons that their turn once again, is coming up. That there are among them foreign-born clerics preaching in Arabic of the divine merits of jihad represents another alert and discomfort. The event feared by native Britons is not one Muslims will comfort them for, standing foursquare with them. In 2015 the BBC took a poll to discover that 45% of British Muslims agree that clerics preaching violence against the West represent "mainstream Islam". With all of this baggage little wonder there's an uneasy truce between the two populations; one indigenous the other of immigrant stock so far from the countries of their heritage, religion and culture. All three of which they bring with them when they emigrate, importing some elements of culture that do no favours to the welcoming nation. It's too easy for those who view the presence of a significantly growing population of Muslims as a menace to their traditional way of life as 'bigots', expressing 'Islamophobia' through distrust and suspicion. In another nearby borough of London, Dagenham, neighbour to Barking, Peter Harris, leader of the local branch of UKIP, a nationalist conservative group, has done his utmost to forestall the building of additional community centres and mosques to accommodate that growing number of Muslims. White British natives like himself, according to Harris represent "an endangered species" in London, with the borough he represents "the front line" of a battleground". He will go to any length to contest any initiatives to use available space for Islamic community centres with spaces for prayer rooms. Considered far-right UKIP, the British National Party succeeded in winning roughly 20 percent of the vote (U.K. Independence Party). At the Al Madina Mosque, Ashfaq Siddique places flyers in the mosque's lobby reminding those in attendance of their 'religious duty' to report signs of radicalization to a confidential police hotline. On the other hand, he disagrees with the Home Office's counterterrorism program, Prevent which requires teachers, social workers and other government employees to notify local coordinators (usually a police officer) of any Muslim matching a checklist of "warning signs". This kind of 'domestic surveillance' targeting Muslims doesn't sit well with the community. "Concerned parents come to us and say, 'I don't want to go to the police; the Prevent program will tag my child'," said Siddique. This is the 'catch-22' Britain faces. "Israel strongly condemned the 'painful terror attack in Egypt' and sent 'the condolences of the Israeli people to [Egyptian] President [Abdel-Fattah] Sisi and to the Egyptian people,' in a statement from Prime Minister Benjamin Netanyahu’s office." "'There is no difference between terrorism harming Egypt and terrorism harming other countries. Terror will be beaten more quickly if all countries work against it together,' the PMO said in its statement." "[The attack] will not go unpunished. [Egyptians would] derive hope and determination from such pain to triumph in the war against black terrorism." "We will remain steadfast and will fight back with an iron fist. This attack will only add to our persistence on overcoming the tragedy and we will win the battle against the forces of evil." "The army and police will avenge our martyrs and return security and stability with force in the coming short period." "This is a shift in the tactics of the terrorists." "An attack on civilians at Friday prayers is not something we have been used to seeing." "This represents the scary prospect that the list of targets they are willing to pursue is growing." "It is hard to know, however, if they were targeted because they were Sufis or because they were perceived to be collaborating with the government." "The attack will, over the medium-term, damage el-Sissi's credibility as the figure that can protect Egypt, particularly if the security situation does not markedly improve." 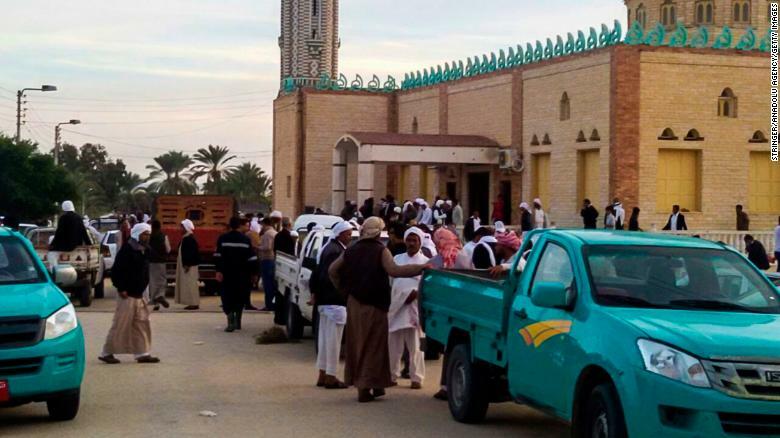 Witnesses to the well-planned and successfully carried-out slaughter of Egyptians living in northern Sinai praying inside the al Rawdah mosque in the area of el-Arish reported seeing the black flag of Islamic State among their attackers. This atrocity had all the hallmarks of Islamic State ferocity in manoeuvring victims toward certain death. Four off-road vehicles carried terrorists who opened fire on worshippers evacuating the mosque in panic after a bomb blasted the interior. Care had been taken previous to the attack to block off escape routes when vehicles were blown up and the burning wrecks left to block the roads, making it impossible for victims to escape and difficult for rescuers to enter the area. As ambulances arrived they too came under deadly fire. Over three hundred people, an estimated 30 children among them, were slaughtered, and another hundred people injured in the flash firestorm. Sufis, who practise a philosophical form of Islam instead of the more mainstream literal form, were the target, along with the many military and police who regularly attend the mosque. 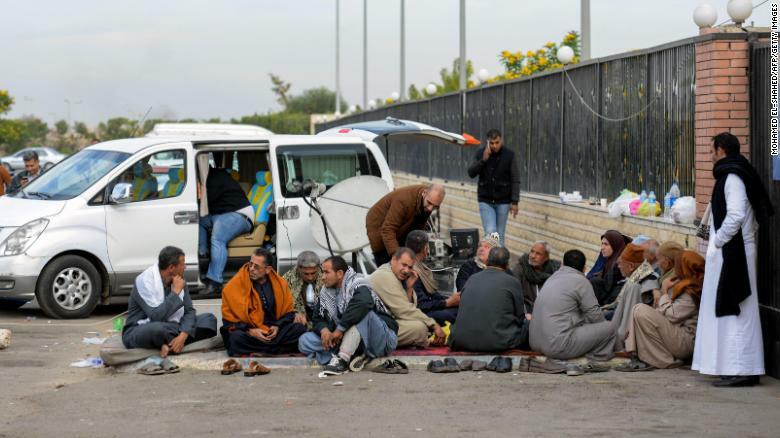 A committed branch of Islamic State in the Sinai has been responsible for deadly bombs targeting churches in Cairo and other Egyptian cities, killing Egyptian Coptic Christians. The deaths of 226 people from an explosive in the cargo of a Russian passenger jet in 2015 was also attributed to the Sinai Province terrorist group. Taking its cue on publicizing its medieval era savagery the Sinai ISIL branch beheaded an elite Sufi religious figure, blind Sheikh Suleiman Abu Heraz a year ago, taping and posting photographs of the murderous event online. When the Muslim Brotherhood's Mohammad Morsi was removed from the Egyptian presidency three years ago by a popular revolt led by the-then military's top general, now president of Egypt, the Sinai became a hotbed of violent revolt. 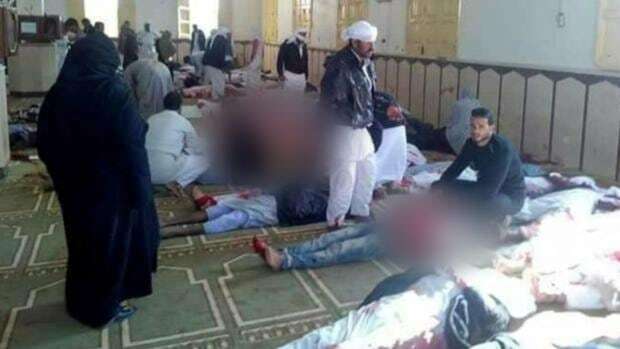 Salafist Bedouin, groups with the Muslim Brotherhood, Hamas and al-Qaeda and then Islamic State all targeted Egyptian military and police quarters, killing hundreds of Egyptian police, army and politicians. Villages and desert outposts teem with insurgents threatening Egyptian security forces. And while the military has succeeded in ensuring that wholesale territory has not fallen to the terrorist groups, neither have they succeeded in bringing security to the region. The Sinai, which since the handover to Egypt by Israel in its peace agreement, had become a source of badly needed investment and tourism in a faltering economy, has seen the tourism industry once again decline resulting from incessant insecurity. When the Sinai Province group targeted the Russian plane flying tourists in the Sinai back to Russia it pronounced the death knell of Egyptian tourism as a thriving part of the nation's economy. The shocking death toll of this latest bloody assault, considered the largest and most deadly yet suffered in Egypt at the hands of terrorist groups led condolences o pour into Egypt with messages of support from Israel, the United Arab Emirates, the United States, Russia, France and Britain in condemnation of the unspeakable violation of humanity. Egypt's uneasy peace agreement with Israel mandates Israel's empathy, rarely reciprocated. 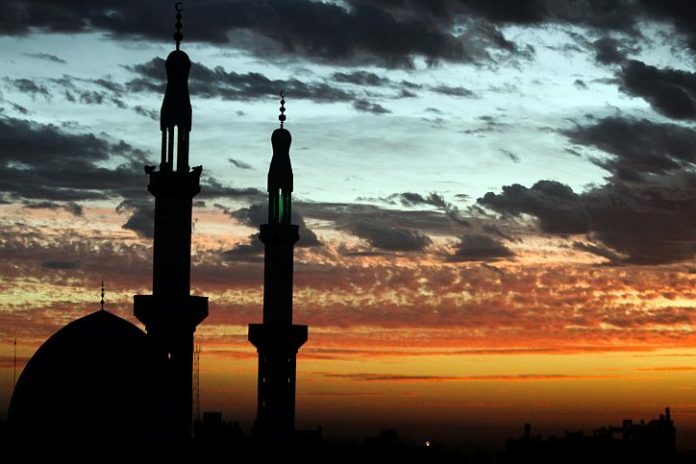 "The ar-Rawdhah Mosque in Bir al-Abed, west of Arish city, was covered with blood and bodies – of the dead, the dying and the wounded survivors – as those fortunate to evade the bomb blast and the indiscriminate gunfire of the masked murderers shooting from four vehicles that almost surrounded the mosque, ran helter-skelter for their dear life." "It seems this is what Egypt has to pay for its unwarranted coziness to Saudi Arabia, whose billions of dollars in aid, is not just holding the government of General Abdul-Fattah as-Sisi in ransom, but allowing Takfiri terrorists to spread their deadly tentacles in the predominantly Sunni Muslim country." "We in the Islamic Republic of Iran, the prime victims of terrorism (sponsored by the US and the Salafis), strongly condemn this dastardly act by the Wahhabi-Zionist agents, and join our Egyptian brethren in their hour of grief." Sheikh Ahmad at-Tayyeb, the head of al-Azhar, the famous Sunni Muslim seat of learning, who over a year ago had issued his famous verdict that the Wahhabis are not part of the Ahl as-Sunnah, denounced Friday’s massacre. Kayhan International, Iranian News Service, "Iran Samaneh"
"Officers in schools, in uniform, create a safer learning environment and foster relationships between the police and young people." "Partnerships like the ones we develop with schools are at the core of the service's modernization efforts to move toward a neighbourhood-centric model of policing." "In the face of this data [report from staff at Toronto District School Board] we have a clear duty to act on behalf of our students, and address the concerns they have brought to our attention." "Staff will continue to work with police in order to build a partnership [with police] that honours the voices of all students." "[It is the board's priority] to mitigate against the differentiated and discriminatory impact of the School Resource Officer [SRO] program." "When someone sees you talking to the police, they think you are a snitch. "And that's if. Your life is over." "It's good [to have uniformed police in the school] in case there is a serious situation where someone could get dangerously injured." "SROs don't really harass people in the school. They ask you what is the problem." The problem is that there is a problem and the solution that appeared to work very well, has been rejected by the very students that represent the problem, while the students who benefit from the presence of police have had their opinions stifled. All it takes is one dissenting voice, irrespective of the obvious that the dissenter represents a minority whose actions have brought the police presence into the schools as a preventive measure, to begin with. This is the era of political correctness. So the fact that among the black community gangs and illicit activities and anti-social behaviour is a threat to the majority of students' safety requires mediation of a type that will influence the outcome toward safety for both potential malefactors and their victims can be set aside in deference to the complaints of the aggressors, ignoring the needs of the victims, appears to give the appeasers great sanctimonious satisfaction. No segment of any community appreciates being singled out as appearing to be a potential threat to the larger community.And because of course it is a group within a group in that the sociopathic action of a small percentage of the target group that is at fault, the entire group feels ill done by, through default association. In the black community of Toronto there is a penchant among youth to gravitate toward gangs, guns and drugs. Violence erupts on occasion, sometimes lethal violence, and the black community in its entirety seems to close ranks instinctively. Not only are witnesses not available for police investigative aid, but the greater community is aggrieved that public attention is focused on them. Safety for students in the schools is an obvious concern for parents. And when an initiative was undertaken years ago to have uniformed police monitor schools and make themselves available in a preemptive capacity, tensions declined. The police made an effort to present themselves as social peacemakers and intermediaries. They were there to help, to befriend, to offer advice and alternatives. The reason for their presence acknowledged, and inevitably a level of resentment occurs. A 15-year-old student was shot and killed at C.W. Jeffreys Collegiate Institute in 2007; a year later the School Resource Officer program was initiated. It has served as an effective preventive service since then. It gave comfort and support to parents, it offered substantive assurances to students concerned about the proclivities of some students to anti-social activities. Threats declined, and a kind of truce was put in effect. Now, complaints from a number of students and general agreement from the black community to put an end to the program has resonated with the largest school board in the greater Toronto area, anxious to respond to criticism. Rodney Diverlus of Black Lives Matter Toronto averred that his group, aggressively promoting action favourable to what the black community deems is equal treatment in the greater community, was "cautiously optimistic" school board trustees acceding to the report's recommendation that the SRO program represents a "reactionary measure" in response to a single incident. "This report has really corroborated many of the claims that parents, that youth and students in our community have been saying since the introduction of the SROs", he said. As far as Black Lives Matter is concerned, social workers, child behaviour therapists, hall monitors and increased faculty engagement with students would result in greater effectiveness responding to student needs. On the other hand, the Toronto District School Board staff report declared their review had found the majority of those they surveyed held a positive impression of the program. Some, it notedm felt intimidated by the presence of a police officer in their school, while many others were unaware of the program and were completely unaffected by it. They still felt impelled to 'mitigate' what is perceived as a discriminatory program. "[The decision to stop the SRO program] followed recommendations earlier this month from TDSB staff, who called for termination of the program based on results of a six-week review and input from thousands of students, staff, parents and community members. 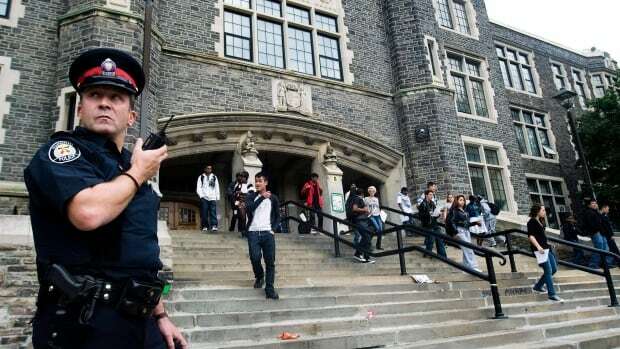 It included surveys completed by 15,500 students with police in their schools." "While a majority of teens reported being satisfied with the SRO program, or had no opinion, staff concluded the thousands who did say that having officers at school made them feel uncomfortable, intimidated and targeted were far too significant to dismiss." "While 57 per cent said having police in school made them feel safer, 46 per cent said they weren’t sure they wanted the program to continue. But 1,715 (11 per cent) said the presence of an officer intimidated them and 2,207 — or 14 per cent — said they felt watched and targeted as a result." "The staff report, applauded by groups like Black Lives Matter, the Urban Alliance on Race Relations and others who wanted officers removed from schools, was unanimously endorsed by the TDSB’s planning and priorities committee last week following a parade of delegates who appeared before them to support the move." "They argued the presence of armed police was detrimental to many Black youth, undocumented teens who felt threatened even though they have a legal right to education, and other marginalized groups. Many proposed that instead of having police on school property, the board should put more resources toward hiring youth counsellors, social workers and launching anti-racism programs." "Given the vitriol and hatred toward Grace Mugabe, I suspect she will move in and out [of her mansion in Harare] but spend more time out of Zimbabwe." "I appeal to all genuine people of Zimbabwe to come together. We are all Zimbabweans ... we need peace in our country and jobs, jobs, jobs." "He [Robert Mugabe] is now the former president of Zimbabwe." Mr. Mnangagwa, Robert Mugabe's former vice-president, is full of praise for the military with which he is closely aligned. He extended his praise to the speaker of parliament and the other party leaders who have all supported the dismissal of Robert Mugabe, Zimbabwean ruler-for-life-almost and their support for his return from exile after his summary dismissal as vice-president and heir to the presidential throne for which he considered himself to have been groomed. At Mugabe's side for almost 40 years, one of the original freedom fighters who helped sovereignty succeed in independence from foreign rule when his country was Rhodesia, not Zimbabwe -- a British colony -- he is cut from the same cloth as Mugabe. 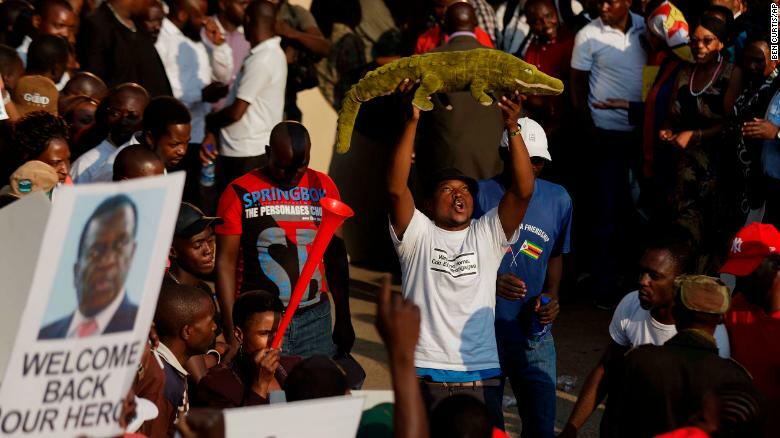 Robert Mugabe may have made the decisions to brutally attack white Zimbabwean farmers and divest them of their holdings, in the process destroying the country's agricultural preeminence, but it was his enforcer, Mnangagwa, who enacted those decrees. Known for vicious brutality, he was popularly referred to as the 'crocodile'. His own ambitions coincided in lock-step with that of Robert Mugabe's wife Grace -- who succeeded in persuading her doddering husband that she would far better carry on his priceless legacy that impoverished the country, sending it into hyperinflation, raising unemployment to impossible levels, creating food and medicine shortages while she burned through the state treasury on shopping sprees -- and she won. When she persuaded her husband to dismiss his faithful colleague who had carried out all his destructive orders as the heavy of the team, neither she nor her husband imagined the reaction, which became a popular revolt in the guise of a military coup. While she fled the consequences, her husband remained in place to meet an African Union delegation to persuade him to step down, but he remained steadfast in his belief that he was beloved of his oppressed people until ZANU-PF dismissed him after the failure of diplomacy persuading a tyrant to depart. Now Emmerson Mnangagwa is prepared to rule in the place of his former mentor. He will complete Mugabe's latest 'term' in office. And in taking his place he will without a doubt truly take his place. The people who believe that they have been delivered from the iron clutches of a tyrant are about to understand that Mugabe's replacement is a replica of the original. This is the fate of Africans; to be abused by one tyrant only to face similar abuse by another. The next 'election' will be held under the same conditions as all those which saw Mugabe 'elected' and re-elected. As for the ambitions of Grace Mugabe, while they are shattered in the political-power sphere, she still has all the riches that she looted from the country that has reeled in a state of dysfunctional poverty for years. The agreement was reached that Mugabe and his family will remain in the country and permitted to retain possession of their 'assets'. The vast mansion in Harare that Grace Mugabe looted the treasury to build to house the nation's first lady will remain hers. The farms she commandeered from other black Zimbabweans who had been allotted them after their divestiture from their white owners may be another thing, if anything remotely resembling justice and an effort to put Zimbabwe back on a working track is pursued. As for the vast wealth acquired by Grace Mugabe as the largest landholder and real estate portfolio in the history of the country, her personal adornments, designer clothing and jewellery, and the way she managed to acquire it all, who knows? 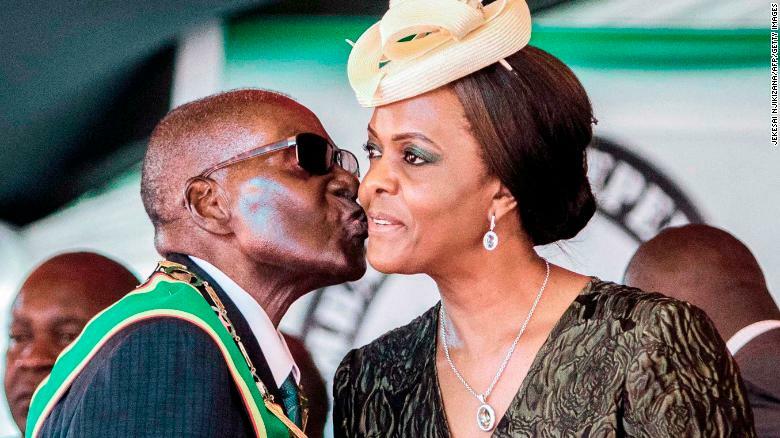 In continued deference to the elder statesman of African leadership post-colonialism -- a man whom even Nelson Mandela made no effort to reprimand for his ruination of a nation and his racial abuse -- for whatever few years left of his life Grace Mugabe will be safe. On his death she would be well advised to make her presence in Zimbabwe a mirage, taking with her into exile whatever she can spirit out of the country. The crocodile has a maw full of vengeful teeth. "You can't monitor them all -- the number of targets are exceeding capacity." "We have a proper security dilemma that no positive progressive thinking program can easily fix." "Then [when the guard is down and the infiltration is complete] the danger begins." "Having profiled these gents for many, many years, [the idea] that everyone is suitable, let alone able, to be reintegrated [back into normal society after having left Canada to join jihadi terrorist groups] is absurd." "What does that mean [deploying resources for surveillance of returning terrorists]? It means I'm spending a ton of resources on what might be yesterday's threat." "The newly radicalized kid goes uninvestigated for lack of person-power." The Canadian Liberal government is assuring Canadians through responses to questions from the opposition in the House of Commons that no problem exists. Yes, of course there is the prospect of increasing numbers of jihadists who left Canada to join terrorist groups now returning, requiring surveillance and extreme caution in the wake of the dissipating fortunes of the Islamic State of Iraq and the Levant. Which has also incited its members to return to their places of origin in the West and there prove that ISIL and its agenda remain alive and thriving. We needn't concern ourselves, assures Prime Minister Justin Trudeau, since Canada's national security agencies are on the job, monitoring returned jihadis who have had their passports revoked and face the laying of criminal charges. And give the government credit; it is engaging in a mind-reversal exercise with the launch of its new Canada Centre for Community Engagement and Prevention of Violence, geared to aid jihadists "let go of that terrorist ideology". Simple, so simple, and so very credible. We do have people of genius quality to think of these things. Perhaps they consulted with Saudi Arabia which also has such a program. Of course Saudi Arabia also practices a double game of financing madrassas whose purpose is to inculcate Wahhabist Islam into the minds and hearts of the faithful, in which the very important concept of jihad is emphasized as an integral part of Islam, one that believers are bidden to obey. Just not in Saudi Arabia. But Canada's program of mind-bending release from medieval brutality and butchery in the name of religion is unique. Guaranteed to succeed with hardened, experienced and driven extremists. Changing minds with ease when "appropriate disengagement and re-integration support" is present and available, as it will be, under this government. Not for Canadians the brutal, inhumane approach taken by other countries like Britain, to 'kill off' their returning citizens seasoned in jihad. Simply enough achieved by removing their citizenship along with their passports, leaving them mired in Syria or Iraq where they are trained to contend with adversity and if death befalls them well so be it, since this is a choice they have made, right? When Canada's public safety minister was asked by immigration critic, Conservative Michelle Rempel how many have returned and are under 24-hour surveillance she was informed security agencies are busy with everything that would possibly keep Canadians safe. Oh, and in the process 'respecting the rights and freedoms' of returnees. Oh my, the rights and freedoms of returnees. Forgot about that, didn't we? It's not only law-abiding citizens whose rights and freedoms concern this government, but that of returnees, those who dedicated themselves to jihad, willing and able to slaughter and destroy in the name of Islam. A phrase that should not be repeated even in impolite company lest one bring down upon oneself the charge of Islamophobia and the potential of being brought before a Human Rights Council. The minister of international development in the United Kingdom made a public statement a week ago that the only way to deal with British citizens who of their own free will joined ISIL, is to kill them. Yes, he said that, obviously having no trust whatever that 'returnees' are readily susceptible to kindly persuasion to behave themselves like good citizens. This is not, however, the Canadian way; amend that; the Liberal Canadian way. "Canada does not engage in death squads", said Goodale, loftily of the fact that the U.S. has explicitly stated its mission is to ensure any foreign fighters having joined ISIL in Syria, die in Syria. Australia and France as well have chosen a similar response to the question. French special forces in cooperation with Iraqi units are hunting down and killing French fighters. But this is not Canada's sunny way, not at all. According to an intelligence officer with inside knowledge, the RCMP and the Crown look for "hard and irrefutable evidence -- the perfect case" related to those suspected of terrorist activities. CSIS responds to jihadists returning and appearing to behave as normal citizens do, by tasking surveillance teams, intelligence officers, analysts, translators and technicians in an effort to monitor as many suspects as possible in responding to this seemingly intractable situation. And the pity of it is, there are just so many warm bodies to deploy, and no more. "He could be in our community at any time without the public's knowledge because the review board does not have the public's safety as their paramount concern." "If Allan won’t be high-risk designation then who will qualify for high-risk designation?" "Our fear is real. What he did was heinous. And he shouldn’t be able to walk the streets. He should be in care for the rest of his life." "There is nothing in the anger situation that takes him out of the regular stream. It's the psychosis risk that puts him into the high-risk. And that psychosis is under control,"
"What happens when his behaviour deteriorates, even under mental-health criteria? He is managed properly within that scheme." "He is just a disagreeable personality who has a lot of problems with conflict management. Nobody is saying otherwise. What we're saying is, does he get to that next level?" This is a man, once described by his wife Darcie Clark, as a model husband and father. Allan Schoenborn of Merritt, British Columbia however, was found not criminally responsible due to psychosis, though he was convicted of first-degree murder in 2010 for killing his daughter and two sons. After their murder he fled, leaving his wife to find the bodies of their children. He was captured after a ten-day hunt. He pleaded not guilty to the murders, was found not criminally responsible because of a mental disorder. Now his wife is concerned that the father of her children, who murdered them, will be free soon to re-enter society. Ten year-old Kaitlynne was stabbed to death by her father. Her brothers, Max and Cordon, eight and five were smothered to death at the family home in Merritt, B.C., in April of 2008. 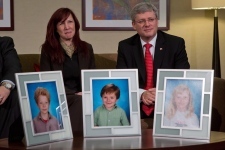 Their father murdered his three children with good intentions, to save them from a life of sexual and physical abuse. The imagined abuse might have emanated from a diseased brain; it might have been interpreted by this man's own urge to abuse his children and rather than restrain himself, he killed them. He has been undergoing treatment at the Forensic Psychiatric Hosp8ital in Coquitlam, British Columbia. Where a review board reached a decision relating to the possibility of escorted outings for this man, alarming his wife in the potential for him to be released from incarceration. The discretion to grant escorted outings was originally agreed upon in 2015, though no such outings took place. His custodial conditions underwent no change when the outings decision was revisited and granted. The possibility of escorted trips outside the hospital is seen as a useful mechanism to advance the treatment given to this man in the hopes of motivating his recovery. According to Crown counsel Wendy Dawson, the false hope of escorted outings could very well have an opposite effect; by persuading Schoenhorn to regard his treatment team as an obstacle to accompanied access outside the hospital grounds. The Crown also wanted the panel to ensure the hospital notify family and police of any such outings. Escorted outings begin in a series of three assessment trips within a fifteen minute radius driving outside the hospital grounds, each lasting up to an hour's duration, with the patient not permitted to stray further than an arm's length from staff, other than when a bathroom is being used. The initial assessment completed, the next step could be for escorted outings in the company of up to eight other patients with two staff members accompanying each patient. It's hard not to imagine the mother of three pre-teen beloved and dependent children failing to champion the release of their murderer on such trips with an eventual goal to reintegrating him into the community. Every day must surely be a nightmare of remembrance for a woman who once viewed her husband, the father of her children, as loving and trustworthy. "It is a different world over there." "You see and feel the difference as soon as you cross the bridge across the river -- the roads, the bureaucracy, the mentality." "It is not really even a town over there -- just a road or two." "Of course, it is better here in Narva than in Ivangorod." "We are all Russians, but we have a different mentality here." "We are used to European ways." Photo by Jaak Kadak. Nova (on the left) prospers while Ivangorod the Russian town across the river, is slipping ever further behind. It was once a city, but now the city that once was, under Soviet Union rule when Estonia was just a part of the Union of Soviet Socialist Republics, is now two towns; one located within the border with Russia, the other just across the border, in Estonia, with a river separating the two and a bridge connecting the two halves that once comprised a unified city. The bridge itself fell into disrepair and has only recently been reopened after refurbishment made it usable once more. But it isn't only the Narva River that has so effectively divided those two towns, of which both populations are Russian speaking, ethnic Russians. Narva has a population of roughly 60,000 (80% ethnic Russians) as compared to Ivangorod in Russia with about 12,000 inhabitants. For its population, Narva boasts modern hospitals, swimming pools, shopping malls, a university and freely accessible Wi-Fi. In sad contrast Ivangorod has none of these civic amenities. That does not describe the only differences between the two; wages, for example; the average monthly wage in Ivangorod is $500, in Narva it is twice that amount, while pensions between the two compare on an even wider scale. Russian speakers in Narva watch Russian state television and think highly of Vladimir Putin, though they are content to live in Narva as a considered choice, spurning the alternative, to live in Ivangorod. 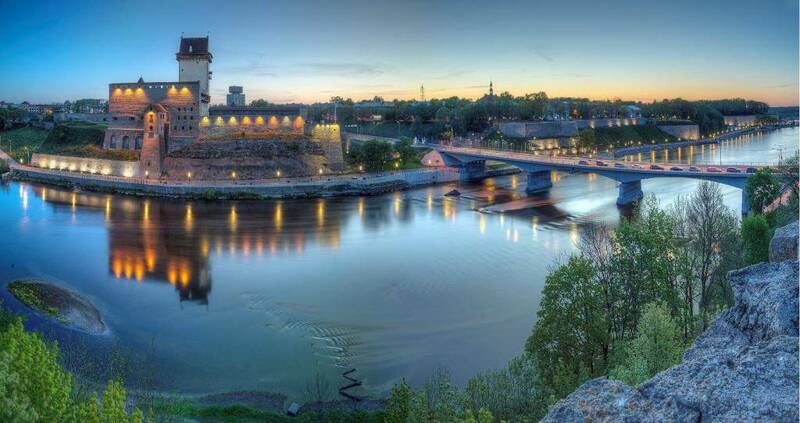 The European Union gave both of the towns funding to enable them to build promenades on each of their sides of the Narva River, as a manner of prompting cross-border harmony between the two Russian-speaking civic enclaves and promoting tourism in the process. Narva received $830,000 and with it completed their promenade which turned out eight times longer than the one Ivangorod built for the $1.2-million they were given. Ivangorod officials explained that topographic challenges accounted for the differences in both cost and completed project, while critics in Narva point to what they say accounts for the reality leading to the fact that for less funding the Estonian town completed a much more sophisticated and longer promenade; fusty old bureaucracy leading to systemic problems characterized as corruption. "Almost certainly" corruption was the reason for the disparity between the two end results, according to the former editor of a Russian-language newspaper published in Narva. Ivangorod is the site of a venerable old fortress built in 1492. The Church of the Holy Trinity is also located there, a cluster of spires and cupolas, situated on the edge of a lake, and newly renovated from the ruined state it fell into during Soviet rule. Russia's state railway company provided the funding for its renovation. Because of the church, the fortress and a few museums, the Russian town is an excellent candidate for tourism. Unfortunately, most visitors are unable access the site since all Russians living outside the border area, along with any foreigners wishing to visit must first submit an application to obtain permission from the Leningrad Region branch of the Russian interior secret agency, the F.S.B. The process can take up to four months for the needed permits to visit Ivangorod. Try to visualize a tourist sticking around for that length of time to be enabled a half-day visit to the town. 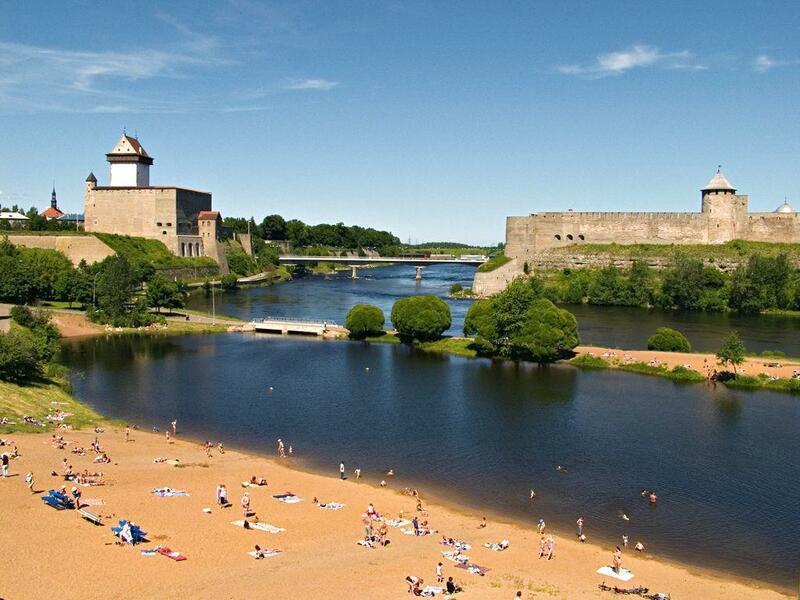 Narva too has a fortress and museums, both of which are freely open to anyone living in Estonia, as well as to foreign visitors. A venture to initiate a shuttle bus service to Narva from Ivangorod was initiated by the European Union funding it, abandoned however when the Russian town insisted on requiring $4-million just to build a bus stop. In contrast, in Narva, where salaries are higher and construction materials costlier, it was felt that $1-million would suffice to build a bus shelter. In Narva, streets are clean and in good repair, contrasting with those in Ivangorod, scarred by potholes and debris-laden. As Ivangorod's mayor lamented, the town is classified as a restricted border zone. "I think the low number of Canadians who celebrate the fact that we have religious freedom is very troubling and really speaks to the forces of secularization that are at work in Canadian society." "It really is time for the religious communities in this country to set aside some of their doctrinal differences and look at coming together to communicate better with Canadians on the role of religion and faith in Canada." "I don't think the people answering this poll are answering from the consequence of day-to-day experience. I think what we're talking about is a public narrative." "[Might it be that those religions receiving negative views are distinguished by the hijab and turban] is a discomfort with the particulars of their faith? Or is it a discomfort with the fact that they're different than us?" These statements resulted from an online poll of just under two thousand Canadian adults, conducted from October 15 to the 23rd of this year. The poll result gave evidence that Canadians, traditionally fairly comfortable with the presence of visible minorities among them, in an essentially immigrant-based society as a whole long accustomed to living and working among people originally from all parts of the world, have now grown restive with the concept of a multicultural society. To anyone with an ounce of brains, it would be obvious why, as Mr. Pennings points out, a level of suspicion has been evident among respondents to the poll with respect to Sikhs and Muslims. Canada's most horrific terrorist experience came out of a Sikh plot among Canadian Sikhs living in British Columbia to strike a blow for Khalistan, a wished-for separation from India for Indian Sikhs. Explosives aboard an Air India flight full of Indo-Canadians was blown up over the Atlantic. The perpetrators were put on trial, but the result was inconclusive and they were never fully held to criminal account for the devastating horror of 329 innocent people losing their lives, in 1985. Little wonder the memory of that dreadful event still shapes peoples' thoughts about Sikh-Canadians. But reasonable people know that the actions of a handful if malcontents with malicious intentions do not represent all those who share a common background. On the other hand, the simple fact is Sikh-Canadians are an integral part of Canadian society. 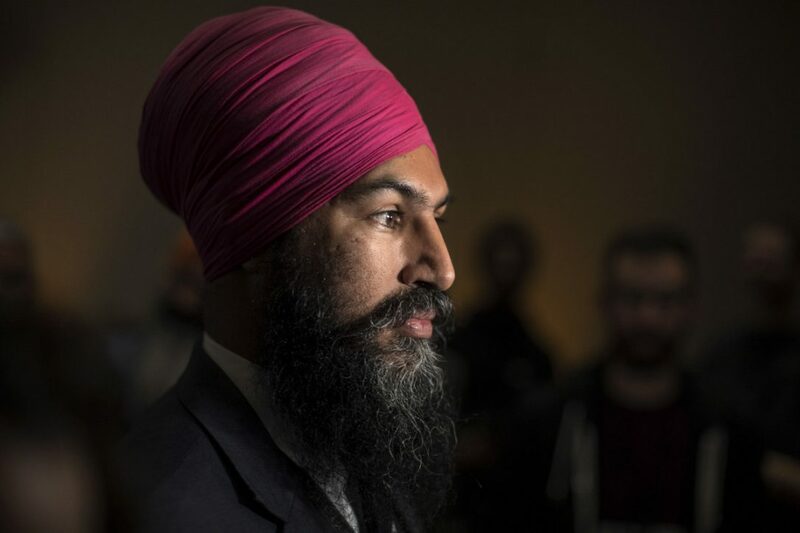 So much so that under the current government, Canadians now have a Sikh as their Minister of Defence, and another Sikh Canadian lawyer has been elected as leader of of the federal New Democratic Party. As for suspicions of Muslims being high on peoples' minds, the reasons are obvious enough. Most of the terrorist groups bedevilling world society are Muslim. Muslims have been attacking one another in bloodthirsty violence reflecting sectarian hatred -- and Muslim countries have spectacularly failed to govern their populations, instead exploiting and visiting violence on them. The world's premier terrorist groups are Muslim, threatening not only their own, but destabilizing and terrorizing the West, from Europe to North America and beyond. Little wonder Muslims are held in suspicion. They are the latest source of the most virulent anti-Semitism. In Quebec which has just adopted a law prohibiting women wearing niqabs from receiving or giving government services, 26 percent of respondents accepted religious diversity while 23 percent rejected it and 44 percent agreed diversity represents a mixture of good and bad. Anti-Islam sentiment however, stands at 46 percent claiming Islam damages Canada. This poll was a joint venture between Angus Reid and Faith in Canada 150. "...If Islam is involved, a significant segment of Canadians will react negatively", an analysis of the numbers by the Angus Reid Institute clarified. Generally, Catholicism, Protestantism, evangelical Christianity and Judaism all received positive ratings overall. With the exception of Quebec where 55 percent claim Islam is damaging and 22 percent claimed the same for Judaism. Overall, a slight majority of 55 percent of respondents felt freedom of religion results in Canada being a better country. Angus Reid perceives the results reflecting a "potential for intolerance toward those of faith, in particular toward adherents of minority religions". On the other hand several groups stood out for growing influence, representing Islam, Sikhism and Hinduism, where the established, traditional religions in Canada appeared to have a dimished influence.